Thermionic devices have practical value in the present day; for example, the X–‐ray tube is used in a host of applications, from airport to medical scanners. They have also long played important roles in scientific research such as particle acceleration, integral to the furthering of modern science. These will both be looked at in greater depth later. Furthermore, radio frequency broadcast effectively utilises their high power advantages and must often operate at high powers in order to give large geographical spread. Multi–‐staged transistor amplifiers for radio broadcast may be sufficient up to approximately 20kW . Scaling transistor amplifiers to higher powers proportionally increases the complexity of the system and solid–‐state dissipation also increases. Vacuum tube technology on the other hand can be physically scaled up, without increasing the core complexity of operation. As output increases, the efficiency becomes much more attractive as a much lower proportion of the energy is lost as heat to achieve thermionic emission. The implications of this are that high–‐powered vacuum tube based transmitters are vastly superior to transistor–‐based solutions. The BBC uses some very high–‐powered transmitters to broadcast radio and television in central parts of the country, which can be found to output 100kW up to 1MW . The highest powered vacuum tube which exists today is the Eimac 8974 (a tetrode) which is able to dissipate 1.5MW; physically large and water cooled, it is used only in commercial broadcasting and military applications . Military applications favour vacuum tube technology for their high power characteristics for use in radar as well as an apparent natural tolerance to electromagnetic pulses, which occur during nuclear explosions as well as environmental variations due to solar emissions . Perhaps a more curious application of vacuum tubes is its application into sound amplification. Sound, like taste, is viewed as subjective so one cannot solely use empirical quantification as evidence for the use of vacuum tubes in many modern amplifiers for musical instruments. Around the late 1940s and early 50’s originated the genre of rock and roll, with electric guitar as lead instrument, vacuum tube amplifiers were very much a part of their distinctive sound. Of course, at the time they did not have the choice of using transistor amplifiers, however, modern musicians today still very much desire the original tones created back in 50’s achievable using vacuum tube based amplifiers. There is strong debate concerning the favourability of either type. A very significant number of people believe valve technology produces much clearer tones. Looking at specifications of high–‐end models actually yields very similar operating characteristics. 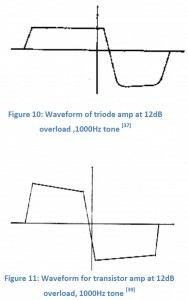 The audible difference has been shown to possibly manifest in the different harmonic responses when over driven. 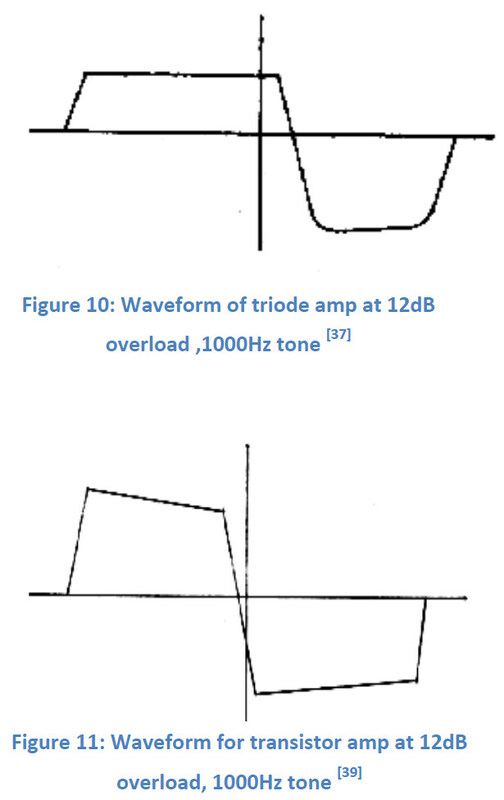 Valve amplifiers seem to clip much more favourably and smoothly than transistor types (figure 10 illustrates a response that exhibits softer clipping). Depending on which harmonic distortions are most dominant, over drive will cause varying tonal modifiers. Transistor amplifiers give off strong 3rd and 5th odd harmonic tones, which have a blanket and metallic effect respectively . Valve amplifiers tend to have dominant even harmonics producing “choral or singing sounds.” These are generally accepted as much more pleasant distortion characteristics, preserving clarity further than odd harmonic dominance. Distortion is so often apparently, either on purpose or undesired, that valve–‐based amplifiers may be thought as more flexible to real life conditions than transistor based types. Only when both are kept in linear regions are they for the most part equal. Valve amplifiers have a great shortfall it that the transformer circuits are extremely expensive . This is for the most part eliminated in transistor–‐based designs. The consequence of this is that vacuum tube variants do not exist in the low to mid priced range and for this reason alone they have been mostly replaced by solid state in mainstream consumer applications. A magnetron consists of two parts: the tube core and an electromagnet. In the tube core, the filament (cathode of the tube) is carefully sealed into the tube and is placed at the centre of the magnetron. 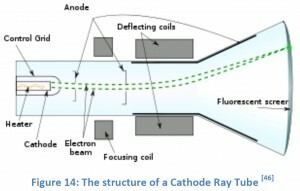 The anode is a hollow cylinder of copper, which surrounds the cathode and the tube core (figure 12). A magnetic field is provided by an electromagnet in parallel to the filament, hence when the electrons are accelerated from cathode to anode, they spiral outward in a curve rather than moving directly to the anode. The anode block of the tube includes many cylindrical cavities (figure 12), which each serve as a resonant RC (resistor–‐capacitor) circuit, causing electrons to bunch into groups. An antenna will transmit a part of this RF (radio frequency) energy . The microwave oven is one of the most widely used household appliances. The reason for its popularity is its ability to heat food quickly and efficiently. 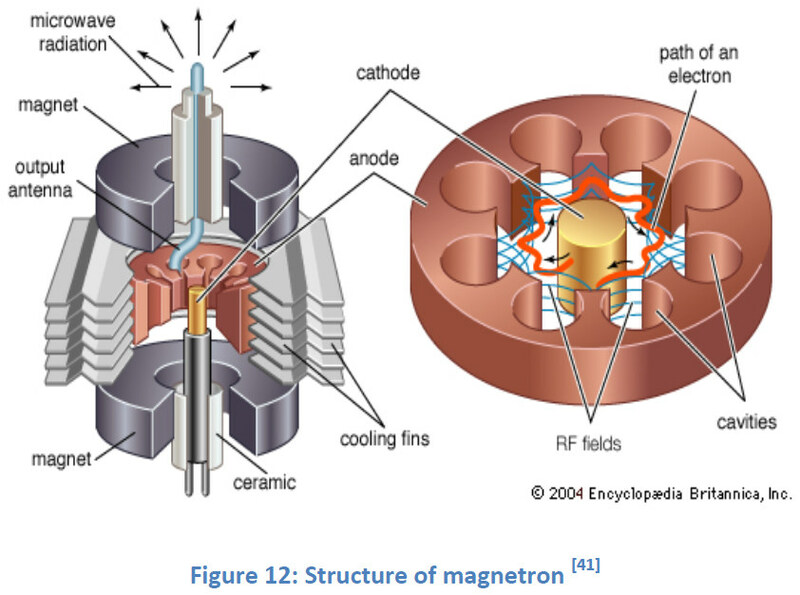 The magnetron is the heart of every microwave oven. As its name suggests, microwave ovens use non–‐ionizing microwave radiation to heat food. 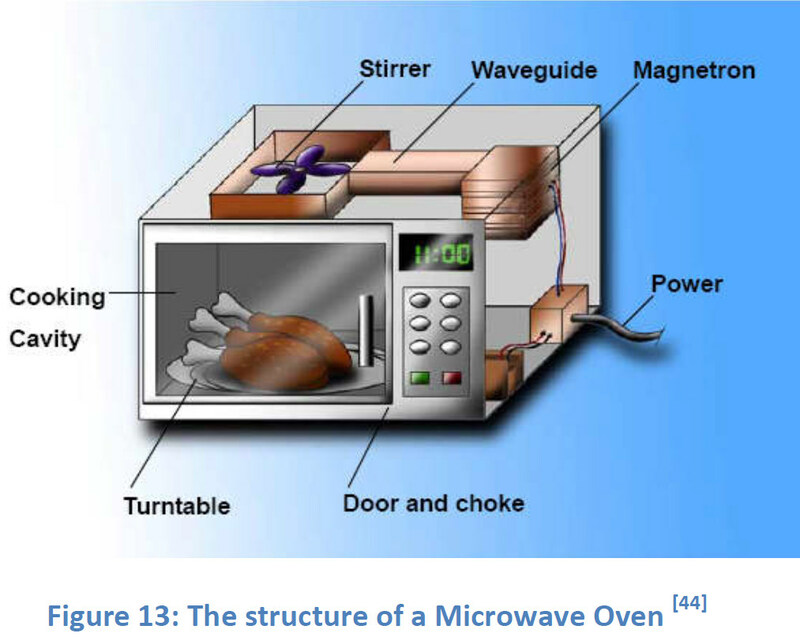 In order not to interfere with radar and other communication systems, the frequency of microwaves generated by the oven is usually designed to be 915MHz or 2.45 GHz . The transformer in the oven raises the 220V household voltage to 3,000V or more and delivers it to a magnetron. The magnetron generates microwaves, sending them through a waveguide into the cooking cavity. The stirrer at the end of waveguide distributes the microwaves evenly . 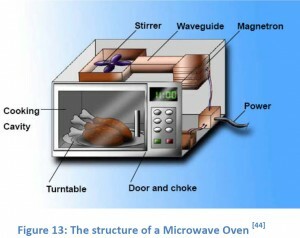 Not everything is heated in the microwave oven, only molecules that are electric dipoles (a polar molecule with equal and opposite electric charge) such as water, sugar and fat, will absorb energy from the microwaves. As the microwaves consist of oscillations of electric and magnetic fields perpendicular to one another, electric dipole molecules tend to align themselves with the electric field because they have positive and negative charges on opposite sides. The electric field in microwaves reverses billion of times a second, causing the molecules to rapidly turn back and forth, collide with one another and hence produce heat quickly. The effectiveness and convenience of the microwave, in addition to the lack of competing technologies, almost ensures its continued use in the future. 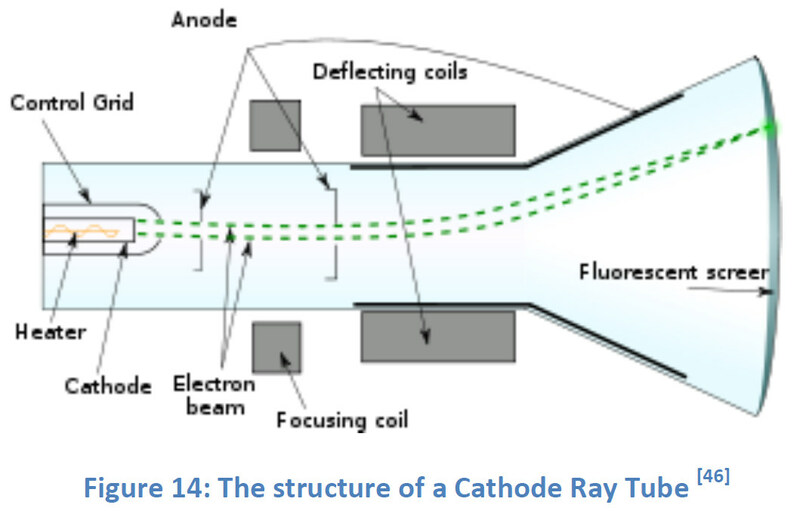 A simple CRT mainly consists of an electron gun (which includes an accelerating electric field), deflection coils, a shadow mask and a fluorescent screen (figure 14). It is used to create images, widely applied on display devices such as televisions, oscilloscopes and computer monitors. However they have gradually been replaced by liquid crystal (LCD) and plasma displays in many applications. An electric field is placed in front of the electron gun and is used to accelerate the electrons emitted by the electron gun. The deflecting coils impose an adjustable magnetic field that is perpendicular to the electric one, thus allowing it to control the path of the electrons by varying the magnitude of the magnetic field. The image will appear when electrons hit the phosphor screen. The television set (or computer monitor) is one of the main applications of CRT. However, by 2008, although CRT TV and computer displays were still used in developing countries, they had almost disappeared in the developed world. The liquid crystal displays have become more and more popular in recent years. By comparing these two competing technologies, we can begin appreciating why this is the case as well as determine whether CRT will continue to be employed in future. The following characteristics will be used for our criteria. Resolution: A colour CRT display has three electron guns and three different phosphors on the screen which emit red, blue and green light respectively. A metal plate with tiny holes is placed in front of the fluorescent screen to ensure that the electrons from each gun strike the corresponding monochromic phosphor. This metal plate is known as shadow mask. The distance between holes on the shadow mask is called dot pitch, which determines the maximum resolution of a CRT display. (The dot pitch is the distance between a dot and the closest dot of the same colour on a colour CRT.) The smaller the dot pitch, the more pixels the screen can accommodate, hence the higher the resolution. A CRT can display an image with any resolution lower than the maximum dot pitch defined resolution, as the electron gun can flexibly make adjustment . For LCDs, on the other hand, the pixels have a layer of liquid crystals aligned between two electrodes and two polarising filters that are perpendicular to each other. 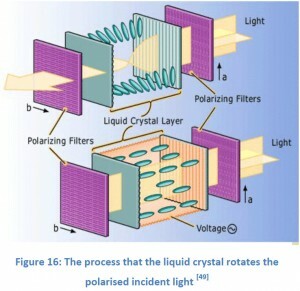 Under a control signal, the liquid crystal molecules twist themselves to reduce the rotation of the polarization of the incident light in different levels to pass light through the second polarizing filter. Hence the image appears on the screen. The imaging principle of LCD determines that for a fixed size of screen, the pixel arrangement is only suitable for image (signal) with a particular resolution (native resolution). Once the resolution is changed, the image on an LCD will be distorted . Refresh rate: For CRTs, the refresh rate is commonly referred as vertical scan rate. Corresponding with it is the horizontal scan rate. Horizontal scan rate is the time taken for the electron beam to travel from the left side of display to the right and back and therefore describes the number of horizontal lines displayed per second. The CRT must scan vertically one horizontal line at a time; one entire completion of the screen is called a refresh. This is where the term refresh rate comes from. Clearly, the total number of pixels within a display determines the refresh rate–‐ the higher the resolution of display, the slower the refresh rate. LCDs are significantly different in the way they refresh, however. Firstly there are no black states due to existence of a backlight and the LCD will refresh all at the same time unlike the scanning method CRTs employ. This means LCDs cannot flicker, instead refresh rate is important in determining how smoothly motion is displayed. Generally speaking, a CRT refresh rate must be higher than an LCD to maintain a comfortable viewing experience (approximately 85Hz on CRT or 60Hz LCD) . Response time: is the minimum time to change a pixel’s brightness. Because of its imaging principle the CRT maintains a high frequency of impact between electrons and fluorescent screen to form a static image. For this reason, response time could be said to be limited by refresh rate/scan rate as actual response time for each pixel is almost instantaneous (order of a magnitude faster than LCD). For LCDs, although the response time continues to reduce, high quality colour reproduction panels (non twisted nematic) have relatively slow response times (8–‐16ms) . This can cause smearing around fast moving objects (known as ghosting), which makes the LCD somewhat unacceptable for fast moving video. Other issues: LCDs have absolute advantage in terms of volume. The thickness of an LCD will only be a few centimetres no matter how big the screen is. 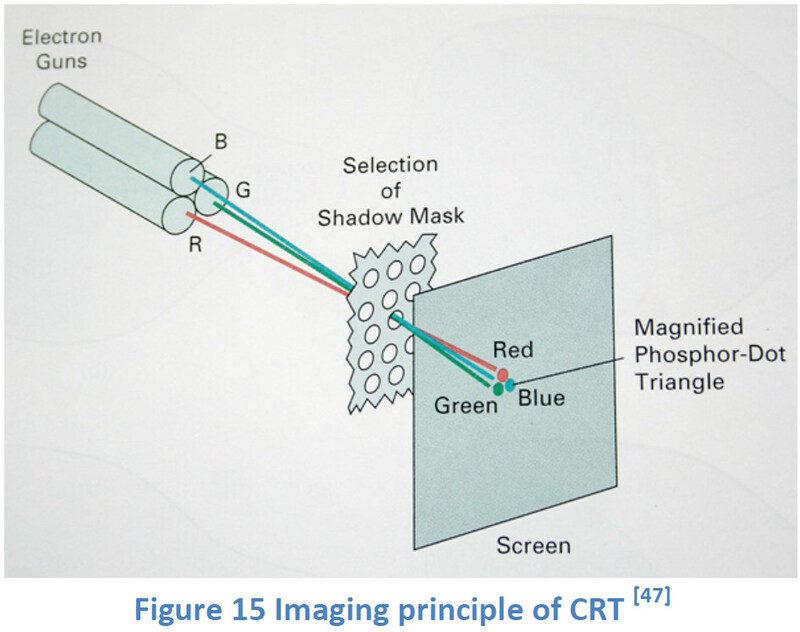 But for CRTs, the larger the screen, the greater the volume will be occupied because of its imaging principle requiring the projection of the electron beam. This has proved a crucial commercial factor, as most consumers prefer the less obtrusive LCD, despite the CRT providing superior viewing in many respects. For CRTs, there exists a controversy on the emission of radiation. While small as most is filtered, there is some X–‐ray radiation emitted. Unlike CRTs, the light source of LCDs can be made up of incandescent light bulbs or light–‐emitting diodes. LCDs consequently do not emit any ionising radiation. CRT technology is seen as evolution of the vacuum tube and takes an important place in widespread household technology. While gradually being superseded by LCD technology due to practical issues such as size, CRT has held some distinct advantages, which for some time, gave scope for further evolutions of the technology. The most notable development was in the early 2000’s where various companies came out with competing technologies to improve upon LCD contrast ratio and their inherent poor black levels due to the CCFL backlight required to illuminate the LCD pixels which themselves emit no light. Emerging technologies at the time included SED (surface conduction electron–‐emitter display), FED (field emission display, related to SED) and OLED (Organic Light Emitting Diodes) variants. 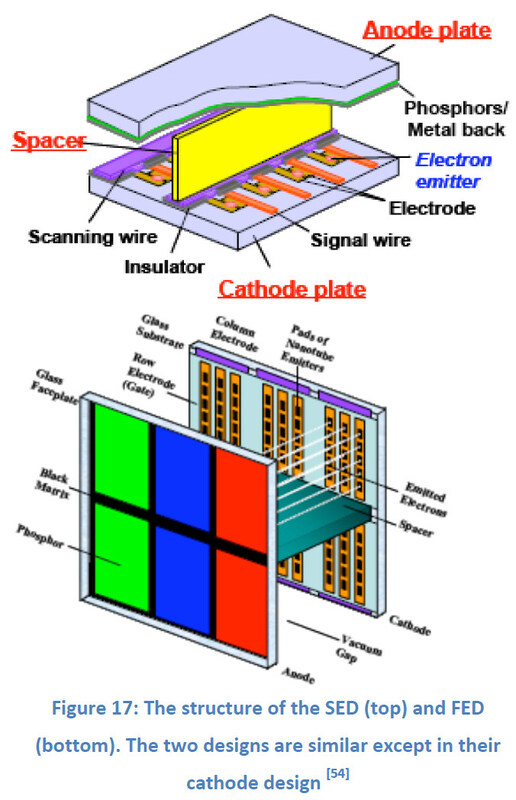 SED based technology use large grids of nano–‐emitters as opposed to a single electron gun which is typical of CRT displays. This allows for the depth of the SED display to be similar to that of an LCD and each pixel may emit its own light allowing for much greater contrast ratios not achievable by conventional LCDs. Figure 17: The structure of the SED (top) and FED (bottom). The two designs are similar except in their cathode design . The structure of SED (top) showing Cathode plate, rib-type spacer and Anode plate . The structure for FED (bottom)  is similar except for details of the Cathode plate. The fabrication and assembly approaches are also very similar, with the major exception being the cathode plate. All FED approaches being developed today require assembling a face-plate (anode) with a back-plate (cathode or electron source), together with sidewalls, spacers and getters. First the anode and cathode plates are fabricated separately, assembled with the other components, sealed using glass frit or other novel materials and then evacuated. The assembly process for a CNT-based FED can be applied to other FED technologies, including SED. In some approaches, the sealing and evacuation steps are combined and still other approaches hope to eliminate or reduce the number of spacers . New materials are under development to replace fritglass seals in order to lower the sealing temperature and to avoid materials with high lead content . The anode fabrication process is very similar for both SED and FED. The black matrix and color filters are used to improve contrast and the metal back film is used to improve brightness and efficiency and also acts as an electrode for the high voltage potential and bleeds charge away from the phosphor during e-beam illumination. These are standard technical modifications used in CRT, FED and high-voltage VFD to improve the performance of the phosphor. As for the anode plate for an SED panel  – although the dimensions may vary, the structure is very similar for other FED displays. Cathode Fabrication Grid Attachment, Spacer Placement, Anode Fabrication, Sidewall Attachment, Getter Attachment, Vacuum Seal, Tip-off and Gettering. FEDs are similar but use different emitters of bundled carbon nanotubes (variations upon this technology are seen in the future section), this allows redundancy for defects due to the number of nanotubes in each bundle. Theoretically this would improve yields on a commercial manufacturing basis. SED are considered a more practical technology to FED as the technology allows greater gray scale uniformity . FED’s can only allow a few voltage cathode voltage levels, meaning that gray is realised using pulse width modulation of the emitters. Combined with un–‐linearity in emitter current, uniformity across the FED is usually poor, until the manufacturing process is improved to give greater control. As of today, both technologies have experienced manufacturing difficulties and failed to reach a commercially viable state before OLED became a natural successor. OLEDs now has most research and development from technology companies, they are able to operate without a backlight and can be made incredibly thin. They do however, suffer from degenerative effects thus have comparatively short life spans. Main developers of SED related technology such as Canon have stated that it has not disappeared entirely and may make its way into professional applications in the near future . SED appears to be a case in which a good technology has not taken hold due to various external reasons, marking a major loss in the commercial future of thermionic technology. TWTs are presently one of the most employed types of tubes. They are widely used in telecommunications, for instance radar systems and satellite transponders utilize them as amplifiers. 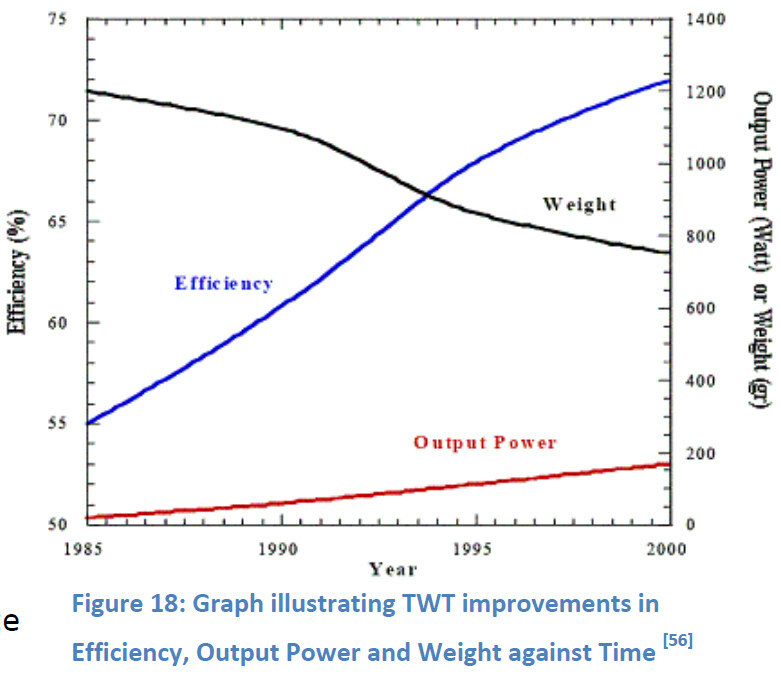 According to recently published papers, solid–‐state power amplifiers (SSPAs) cannot compete with TWTs when it comes to outputting power in the megawatt region at frequencies in the range of 26.5 –‐ 40GHz (Ka Band). 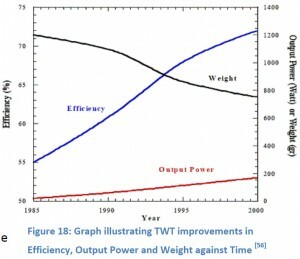 Furthermore, SSPAs only have an efficiency of about 15–20 percent whereas TWTs typically achieve 70 percent efficiency (figure 18). For satellite transponders, where increasing the efficiency by 1 percent can potentially earn $30M more profit throughout its lifetime of about 15 years. As a result, they are certainly the only choice in the foreseeable future. Figure 19: Cutaway view of a TWT  1. Electron gun; 2. RF input; 3. Magnets; 4. Attenuator; 5. Helix coil; 6. RF output; 7. Vacuum tube; 8. Collector. In a TWT, electrons are emitted by an electron gun at one end. As they pass through the tube, these electrons are accelerated and are focused into a beam before entering the tube. It then travels across the helix until it reaches the collector at the other end. A radio frequency (RF) signal is injected from the input, and propagates through the helix coil (known as a slow–‐wave structure) inside the tube until it reaches the output. The RF wave is able to gain kinetic energy from the electrons; in essence, it is amplified. The helix coil elongates the path the RF wave travels so it is able to synchronize with the electron beam. The current induced by the RF wave interacts with the electron beam, so it builds up the helix current as it travels through the tube. The amplified RF travels through the waveguide to the output at the other end of the tube closer to the collector. The attenuator is positioned in the middle of the tube to prevent the wave from travelling back to the input (figure 19) [58, 59]. As compared to TWTs, klystrons, which represent another type of velocity–‐modulated vacuum tubes, have narrower bandwidth of operation but are capable of producing superior power. Invented by the Varian brothers of Stanford University in 1939, klystrons have been used extensively in radar equipment, telecommunications and particle accelerators. In the basic configuration, the electrons are injected by the electron gun into an evacuated tube where they travel linearly towards the positive potential. The input microwave signal is applied to the input cavity, modulating the electric field around it. Depending on the frequency and magnitude of the signal, the electrons passing through the cavity are accelerated or decelerated, and as a result bunches of electrons are formed in the drift space. A standing wave of bunches of the electrons is produced in the output cavity, which location in the tube is related to the transit time of the bunches at the resonant frequency of the cavities. The magnetic field of the electron beam induces a voltage across the output cavity, which gives a linearly amplified microwave signal. Multiple cavities are used to improve the gain and efficiency of the klystron amplifier . Klystrons are capable of producing high–‐power microwave output both for pulsed and carrier wave (CW) applications. The CW klystrons are used for ultra–‐high frequency television transmission and tropospheric communications such as air traffic and marine control (1–‐4 GHz). They are also employed in satellite–‐to–‐ground communication (4–‐12 GHz). With the increase in frequency, the operational power of CW klystrons decreases from about 50 kW to 1 kW. However, the pulsed klystrons used in radars and for driving RF linear particle accelerators can produce up to a hundred megawatts of power . The combination of high power density and efficiency make klystrons, along with TWTs, the dominant technology in the microwave applications mentioned above.